It was 7:00 a.m. now, and small but friendly groups of photographers and bird watchers were gathered around two wood fires. A typically quite morning in the Metroparks was accented by the sound of a small portable generator powering the guest services tent. Outside it was still dark, but inside, park personnel served hot coffee and doughnuts. The occasion was the annual return of the buzzards to Hinckley, Ohio. Their yearly return has been documented since the early 1800’s. Since 1957, the annual return has been celebrated each March 15th by an official buzzard spotting day. Gently gliding on air currents, three turkey vultures (affectionately known as buzzards) circled above the tops of the tall pine trees on the north side of The Buzzard Roost. Binoculars and cameras went vertical as the assembled throng leaned backwards to see them sail overhead. It was a successful trip for Ed and Pat Kubiske who had traveled all the way from Ypsilanti, Michigan for the event. “It’s been a lifelong ambition to come” said Ed. “We finally decided this was the year, and so we came.” In recognition of their trip, Bob Hinkle dedicated the first buzzard spotting to them. 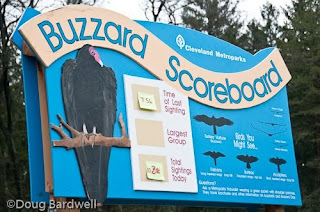 Every 30 minutes or so, the buzzards would once again make an appearance until 10 had been spotted by 9:30 a.m. At that point, the crowd began to disperse, but most would see each other again next year on March 15 when the tradition will repeat itself again.